Tony Stark (Robert Downey Jr.) and Bruce Banner (Mark Ruffalo) have been developing an AI system, named Ultron, that Stark believes can be used to form an Iron Legion to protect the world from threat. However, when Ultron finally mobilizes, he believes he must eradicate humanity in order to protect the world, beginning his attack on the Avengers. 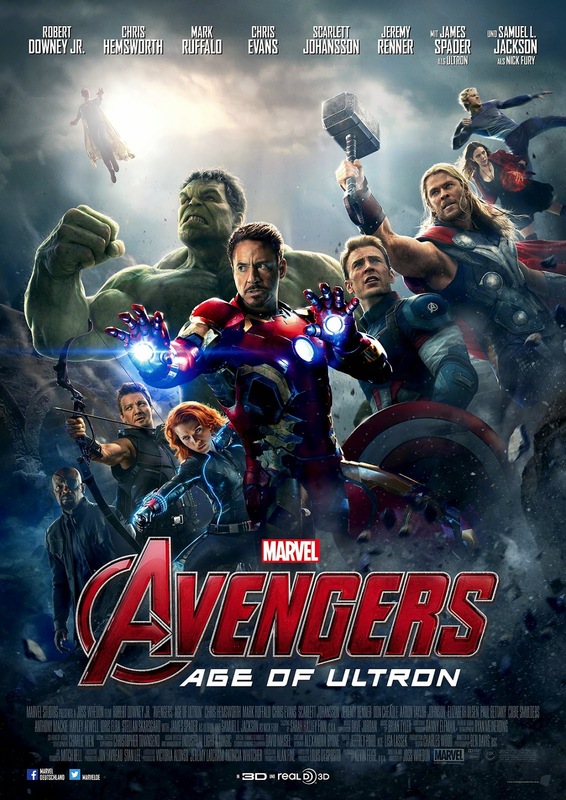 When he flees, Iron Man, the Hulk, Captain America (Chris Evans), Thor (Chris Hemsworth), Black Widow (Scarlet Johansson) and Hawkeye (Jeremy Renner) must hunt him down and stop him from wiping out humanity. It would be justifiable to label Age of Ultron the most anticipated Marvel production yet. It's direct predecessor (Avengers Assemble) was a superb superhero feature; it was fun, it looked great, it felt threatening and it never lost sight of who its characters were. Since then, Marvel has released a string of individualistic films, such as Iron Man 3 and The Winter Soldier. My issues with these individual films were the scale; each film was scaled up to near Avengers heights, and some of them couldn't quite sustain it. But here we are, back with the Avengers coming out all guns blazing, and because of the increased scale of all the previous films, Age of Ultron doesn't quite feel up to scratch. That's not to say it is a bad film; it isn't. In fact, it's a pretty great one. There's just an annoyingly vast amount wrong with it, but we can get to that later. If Age of Ultron knows something, it is how to be entertaining. Across its 141 minute run time, not a second feels wasted. Even when the action calms down and we spend a few minutes in a quiet room, Joss Whedon's script keeps things interesting. One particular sequence involving Romanoff and Banner in Barton's house is arguably the most emotionally powerful sequence Marvel have offered, whilst the humour here is head and shoulders above any other film from the franchise. Even when Whedon resorts to our expectations and gives us exactly what we've expect narrative-wise, the script keeps things afloat to allow Age of Ultron to never stop being the most all-out entertaining offering of the year so far. It also helps that, just as you'd expect, Age of Ultron is a feast for the eyes. The visual effects are as extraordinary as ever, allowing some good action sequences to feel a vast amount better than they normally would. While they may not scale the heights of what came first time around, Age of Ultron does offer some great set pieces that keep the film consistently entertaining. Ultron himself, however, is a rather mixed bag. I really wanted Marvel to go all out here, and create a suitably dark superhero entry into their franchise. But Ultron spends just as much time being dark and creepy as he does being silly and funny, which wouldn't be too bad if Whedon found a midpoint for him to settle into. But he didn't. Ultron is always either funny or dark, but never darkly funny. For such a wild and unpredictable villain to suffer from just two pretty straight forward personality traits feels like a huge missed opportunity. Age of Ultron's tone is a bit messy throughout; it's almost as if Whedon couldn't decide what sort of superhero film he intended to make. It also doesn't help that there is, regrettably, still not much new here. Marvel's Cinematic Universe has been telling the same stories for a few years now, and this needs to be shaken up as quickly as possible. Also, as previously mentioned, due to the enormous up-scaling of the individual character films, Age of Ultron doesn't quite feel big enough. Avengers Assemble was twice the size of all the character films that came before it, but the sequel doesn't feel like a big enough step up. I would also rather not discuss that Age of Utron, like almost every other recent Marvel offering, takes to the sky for its final act. Admittedly, this time around there is a twist on the formula, but it's not strong enough to stop the entire final showdown feeling annoyingly familiar. Age of Ultron has a lot more wrong with it than I'd have hoped. Marvel's Cinematic Universe have dominated the superhero genre for the last few years, and this looks likely to be the most commercially successful offering yet. But Marvel need to find a way to balance out their films. Making the individual stories so much bigger, the films that should feel monumentally huge wind up feeling tame. But, that aside, it would be difficult to sit through Age of Ultron and not enjoy it. Whilst I was hoping for a consistently darker offering than previous entries, and the tone wavers throughout, Whedon managed to keep the film enjoyable from the offset, whilst still adding more depth to characters we already thought we knew pretty well. It isn't perfect, and Marvel still desperately need to tweak their formula, but Age of Ultron keeps the bar raised high for the modern superhero film. To Summarise: It suffers from tonal imbalances and a lack of originality, but Avengers: Age of Ultron is a satisfyingly epic, action packed sequel that reminds audiences why Marvel are at the top of the current superhero chain.